Calgary, Alta. 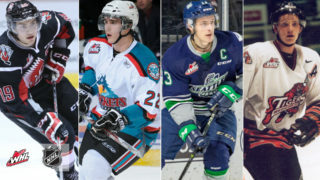 – The Western Hockey League announced today the East Division Academic Spotlight for December, featuring defenceman Jonny Lambos of the Brandon Wheat Kings, defenceman Daemon Hunt of the Moose Jaw Warriors, forward Jakob Brook of the Prince Albert Raiders, forward Logan Nijhoff of the Regina Pats, forward Tristen Robins of the Saskatoon Blades, and forward Eric Houk of the Swift Current Broncos. 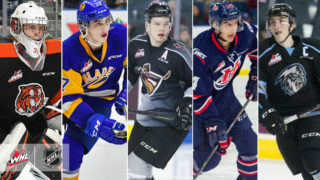 WHL players recognized as Academic Achievers are observed as those striving to reach their full potential in their educational programs while balancing WHL commitments. Jonny Lambos, Brandon Wheat Kings: Rookie defenceman Jonny Lambos, an 18-year-old product of Winnipeg, Man., is excelling in Grade 12, earning high marks in Chemistry, English, and Pre-Calculus at Crocus Plains Regional Secondary School in Brandon. In 25 games this season, Lambos has recorded a pair of assists. A product of the Rink Hockey Academy Prep program in the Canadian Sport School Hockey League, Lambos posted 28 points (5G-23A) in 36 games during the 2017-18 CSSHL Regular Season. Daemon Hunt, Moose Jaw Warriors: Rookie defenceman Daemon Hunt, a 16-year-old from Brandon, Man., is taking the next step forward in his education at Vanier Collegiate Institute, demonstrating a quick learning ability in Grade 11 courses English Language Arts, Health Sciences, Christian Ethics, and Mathematics. Hunt is also excelling on the ice with the Warriors, posting 16 points (4G-12A) in 35 games this season, giving him 18 points (5G-13A) in 44 games for his WHL career. Hunt recently participated in the 2018 World Under-17 Hockey Challenge, playing with Canada Black. 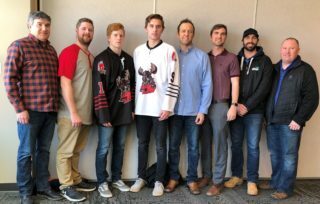 Jakob Brook, Prince Albert Raiders: Rookie forward Jakob Brook, a 16-year-old product of Roblin, Man., is providing outstanding academic results as a Grade 11 student at Carlton Comprehensive Public High School in English, Physical Science, and Native Studies. Brook has been part of a strong rookie class playing a part in the success of the league-leading Raiders, recording seven points (4G-3A), including one short-handed goal, in 36 games with the Raiders. Jakob is also the brother of Moose Jaw Warriors captain Josh Brook and Medicine Hat Tigers defenceman Aidan Brook. Logan Nijhoff, Regina Pats: Second-year forward Logan Nijhoff, a 17-year-old product of Comox, B.C., is thriving in the classroom at Michael A. Riffel Catholic High School in Regina, succeeding in English Language Arts, Chemistry, and Pre-Calculus at the Grade 12 level. The second-year forward has appeared in 40 games this season recording 11 points (3G-8A) and has 17 points (6G-11A) in 70 WHL regular season games with the Pats. Tristen Robins, Saskatoon Blades: Rookie forward Tristen Robins, a 17-year-old product of Brandon, Man., is gaining academic confidence in the FLEX Program at City Park Collegiate, taking Grade 12 courses in Accounting, Pre-Calculus, and English. As Robins has excelled in his first full season at the WHL level, so to have the Blades, ranked third overall in the entire WHL. In 45 games with the Blades, Robins has 13 points (6G-7A) this season after recording a single assist in four games last season. He presently sits second in rookie scoring on the Blades. Eric Houk, Swift Current Broncos: Rookie forward Eric Houk, a 17-year-old product of Regina, Sask., is succeeding academically at Swift Current Comprehensive High School, posting top marks in Chemistry and English Language Arts as part of his Grade 12 studies. Playing with the defending WHL Champion Broncos, Houk has three points (2G-1A) in 28 games and scored the first goal of his WHL career on October 5, 2018 against his hometown Regina Pats.